Tool Trolley ranges from 5 to 10 drawers as per your request. Individual drawers are locked to avoid opening of drawers while in motion. Central locking system is provided. Side perforations are provided for fixing hooks and hang tools which are required. Tool Trolley is very rigid that it has a very long life. 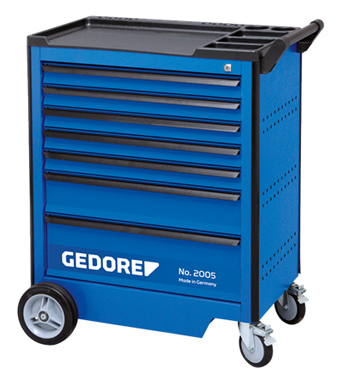 We offer Tool Trolley in 3 brands in which Gedore is the premium one. Tool trolley with Tool sets loaded inside it is also available.